This comprehensive ebook gives you the eye-opening opportunities… from cultivation to retail investment opportunities... and how BEST to invest in each. » CULTIVATION: Discover how growing might hold the biggest profit centers of all! As farms get more sophisticated, demand rises, and sectors expand… profit margins increase for uniquely-positioned growers. » DELIVERY: Ever wonder how pot gets from one place to the other? From seed to sale? Delivery isn’t as simple as Amazon or UPS… but the opportunities might be equal. » PROCESSING: Did you know there are over 25 different ways to ‘consume’ pot? This niche has boundless upside as clever investors know that demand for unique products will drive up this corner of the pot market. » RETAIL: The largest-growing consumer of Pot products is the Baby Boomer generation, and they don’t always want to order online… that’s why the multifaceted retail angle is VERY compelling for investors. » THE HIDDEN BERKSHIRE: A Bonus expose’ on the one company that’s planning a Berkshire move on the market, and how YOU could profit. AND 21 MORE Booming Areas of Opportunity! 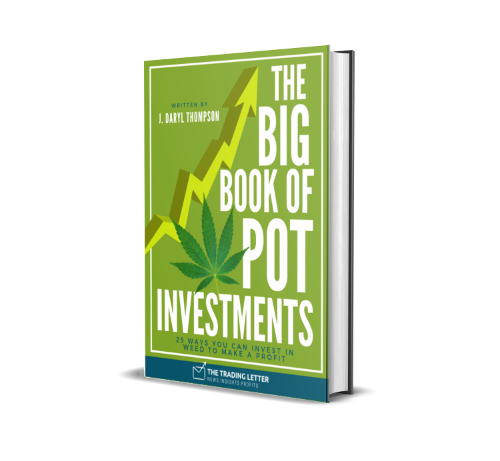 Download your free copy TODAY to decide how you can be a part of the Pot Investment Explosion! You'll also receive a free subscription to our newsletter. But we'll never spam you or sell your email.